Savvy businesses who rely on local search will already be well aware that the key to getting new customers into their stores is by increasing their online visibility; making sure they can be ‘seen’ by anyone who happens to search for ‘jewellers near me’ or ‘closest cinema’. 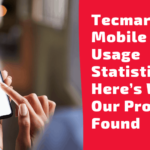 Thankfully there has also been a number of emerging technological innovations that have leant themselves kindly to helping local businesses, opening up new avenues for customers to bridge the gap between mobile device and store visit. 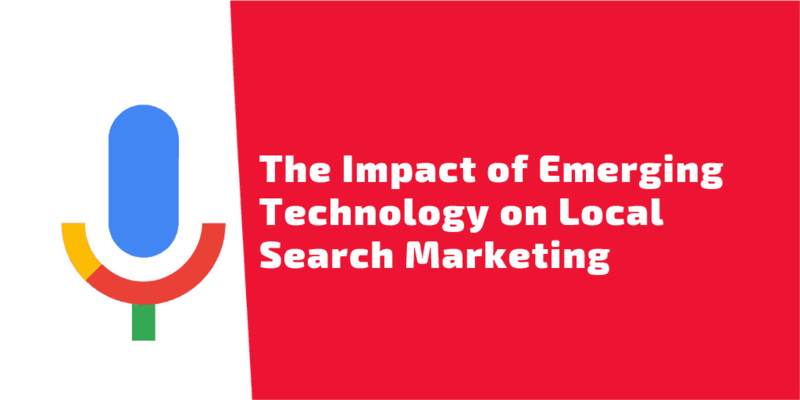 Have a read below at just some of the emerging technology that is helping shape the landscape of local search marketing and the future of consumer trends. Back in 2014 Google found that 55% of teens are using voice search on a daily basis while 41% of adults were doing the same. Alpine.AI are now reporting that in January 2018 there were over 1 billion voice searches. This lends credence to the fact that voice search is an increasingly important way for consumers to get local business information, especially given the release of smart speakers into the market. 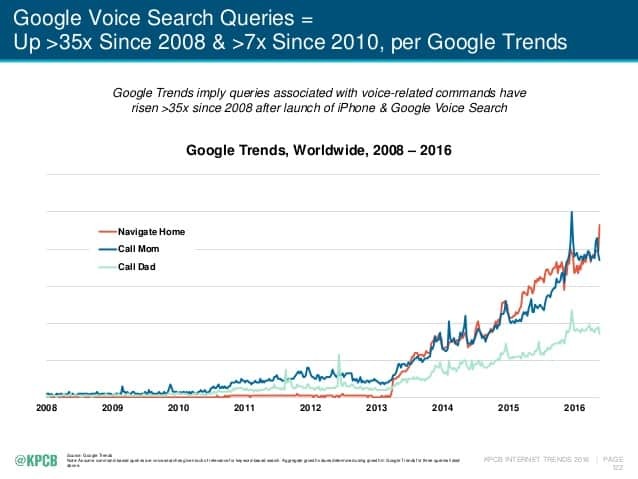 As you can see from the graph from KPCB, the stats show that voice-related commands have been risen 35x since 2008, showing a steady improvement in the popularity of this emerging technology. The Amazon Echo, Google Home and Apple Homepod have all been picked up by consumers for the sole purpose of increasing the amount that voice search is being used for online search. However, this technology is also available through mobile devices in the form of Siri, Cortana and Google Assistant. 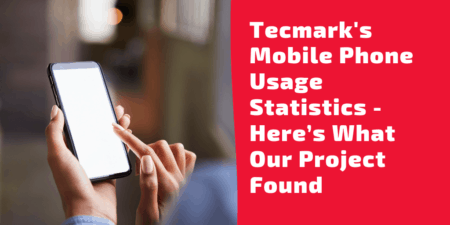 Between them, they have encouraged mobile users to increasingly use voice search as a quick, easy alternative to typing in a search term, and have all been touted as being the most efficient way to find out business information and directions. Speaking of which (pun fully intended), nowhere is the need for voice-activated directions and business information more important than while driving, especially when drivers need to change their course while out on the road. Thankfully there has been significant investment in the way that mobile devices and vehicles interact, with the successful integration of Apple Carplay and the emergence of Android Auto. This allows drivers to use voice search to find destinations, automatically bringing up directions and information for the business they are trying to find. This is a great example of what Google described as a ‘micro-moment’, when potential customers want to impulsively bring up information that they require straight away, including location, contact details or opening times. This emerging technology is being picked up by car companies left right and centre, with Apple alone having incorporated their software into 300 new models. Another emerging technology that has yet to find a solid foothold with consumers is Augmented Reality, but it certainly has had its uses. 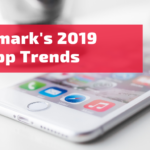 The technology is mainly being picked up by companies that have launched an app that can also access the camera function of a smartphone and lay graphics and information on top of the picture being shown. So far, the most successful AR proponent is of course Snapchat, who have revolutionised the way that people can communicate and layer animation on top of a selfie they are taking. Other companies are also using AR technology to help their customers too. IKEA have released a new app called Place, allowing potential customers to place items from their catalogue inside their home so they can see what it would look like. Google have recently been toying with adding AR features to Street View, which will show mobile users directions to a location by displaying arrows that point down the street you need to take. 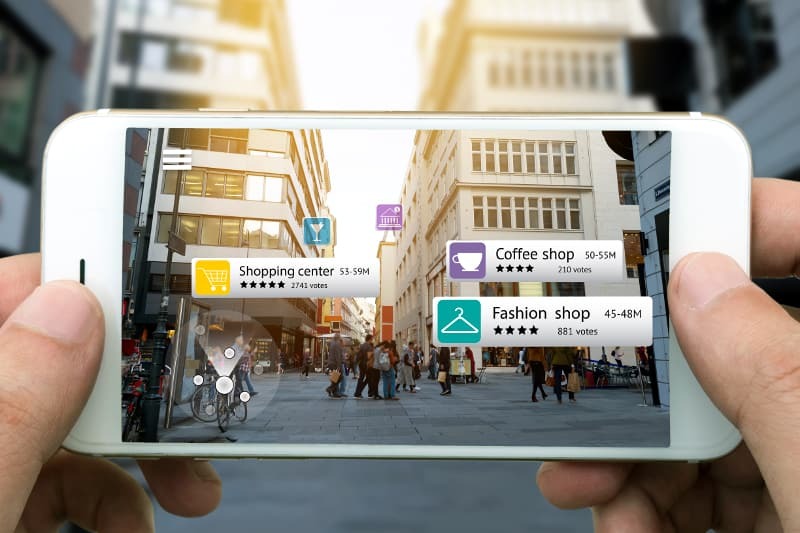 Not only that, early concepts have shown that when mobile users pan their camera around, local businesses will appear as listings in front of them, creating a location-based micro-moment just by using AR. 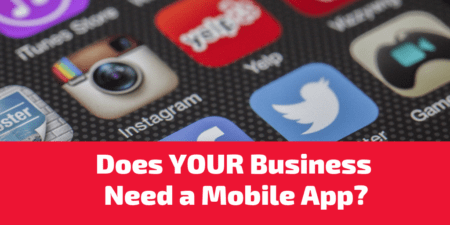 There have been several innovations that have assisted local search in gaining traction and become an important priority for many businesses operating online. 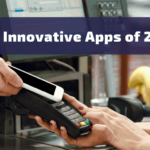 From businesses themselves, these innovations include stores offering a ‘click & collect’ service where customers can order items for collection in store, as well as the ability to check if an item is in stock. These simple tools have now become commonplace for many retailers such as Argos, Currys and even local supermarkets. An integral assistant to local search becoming more prevalent online, Google Maps has also provided many online innovations, including the ability to look round a local store before even setting foot in it. This is once again bridging the gap between a potential customer and physical store, allowing people to have a look around before they visit. 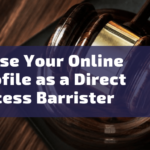 Along with Google My Business pages being claimed so that businesses can be found, Google have also started allowing users to submit posts to this format too. 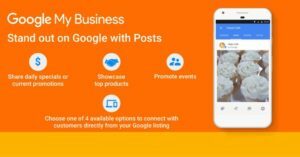 With Google My Business Posts, if a store is hosting an event they can add to their Google My Business listing and display to customers how active they are. This will also show up when a potential customer performs a local search, which may influence when someone is likely to make a purchase in store, as well as increase awareness of a business’s recent activities. Lastly, Google have announced a whole host of updates to their Google Maps app, including an explore tab where people can view the trending restaurants, bars or other places of business in their local vicinity. ‘Your Match’ will show you places based on your previous search history, ‘Group Planning’ will allow you to coordinate with friends over where to go, and ‘For You’ will send you suggestions of places you might enjoy. There is no doubt that thanks to emerging technologies such as voice search, the importance of a business’s local search strategy will only become more of a priority in the future. Consumers have been blessed with technological innovation that has given them the ability to find out business information pretty much instantaneously, which means the way that they access that information will have to keep up. 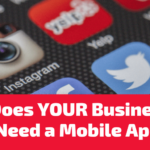 Whether it’s voice search, AR or searching while driving, the importance of making your business visible to an online audience has never been more crucial to a thriving business. To find out how to improve your local search strategy, have a read of our previous post: ‘How Local Search Tactics can improve footfall for your business’. Or, to keep up with the most recent trends regarding local search, have a read of ‘Local Search Marketing Trends in 2018’ instead.